Summary: Data finds out about emotions from Dr. McCoy. Disclaimer: Hmmm, haven't written one of these for a long time! Si, Paramount tienen all. Soy una worm. "I was wrong before, Boy. You don't sound anything like a Vulcan." A contradiction. Data reversed the polarities of several memory engrams. "In what way, sir?" The visit with this human admiral was proving most informative! "'Cause you talk *way* too much. Consarn ... what planet did you say you were from?" "Uh." The admiral shrugged. "Ship? Space station? Where you from, Boy?" "I was constructed twenty-six point three five years ago on planet Omicron Theta by Dr. Noon ... "
"Huh? Make up your mind! You just said you weren't from a planet!" Data reran the previous ten seconds of conversation through his auditory simulator. Ah! He believed he had isolated the source of error in their communication with a likelihood of 0.9998. "Begging the Admiral's pardon, sir, but I did not tell you that I was not from a planet. Rather, I told you that I did not say which planet I was from. I gave that answer, however, before my subsequent statement, which revealed that I was indeed created on ... "
"Stifle it, Boy. You're givin' me a headache even worse than this Godforsaken blue carpet is. Nope, not like a Vulcan at all." They continued to proceed slowly down the corridor. Data passed the long seconds by accessing all information that his mental copy of the Starfleet personnel database carried about the admiral. Finding many intriguing facts, he began to cross-reference in his other databases. He found that, indeed, this particular admiral was more noted than any other Starfleet officer, barring the admiral's closest associates of his day. Data opened his mouth to comment but received error F2749DD061, violating direct order of superior officer. [Override (1/0)?] Indeed, the admiral *was* retired; and moreover, the relative importance of his order had been low. "You want to say something to me, Boy?" "Aw, yeah, I told you to stifle it. Well, it's okay. Out with it." [1.] "If I may, Admiral, I find from my records search that you are much-discussed. Perhaps one could say that you are a celebrity." The admiral grunted, noncommital. "One could say that." He then turned to peer at Data. "Say ... you're not a fan, are ya?" "Fan. A device for creating a current of air or a breeze. A machine for winnowing. An ardent devotee; an enthusiast. Ah. No, sir." "Well, good. 'Cause I've had it up to my pits with those FSNs." [FSN. No entry. Add to dictionary (1/0)? 1.] "Inquiry! FSNs?" "Intriguing!" They had reached the lift. "The turbolift is here, sir." He waited for the admiral to precede him. "Doors too quiet," the admiral muttered. His comment did not seem to require a response. "Sir, if I may, I am indeed not a 'fan;' I am, however, intrigued at some of the articles about you and your colleagues; not so much for their number as for their content. Specifically I am intrigued by some of the articles in scientific journals, for example, _Human Space Psychology_, _Journal Of Confinement In Interstellar Travel_, _Proceedings Of the Society For Space ... "
"Okay, I get the point. But I'm curious ... what was in those journals about me?" "Shuttlebay two," Data ordered the computer before continuing. "In Volume 27, Page 1064 of ... ." He caught himself just in time. "In summary, sir, the articles seem to view Admiral Kirk, Ambassador Spock, and you as the ideal space explorers, each embodying certain diverse characteristics of one theoretical 'perfect' human. And why I am intrigued, sir, is that you are generally considered the governor, among the three, of emotion." "Emotion." The admiral looked askance. "And you don't have any emotions, right?" "Indeed I do not, sir. I had wished to learn from you, if only there were time. I am on a quest to understand human emotion, perhaps even to gain it if I can." The admiral closed his eyes and stood stock-still for 5.2 seconds. Data ran the possibilities, the most likely being that the frail gentleman needed medical attention. He made to call Sickbay but was stopped when the admiral opened his eyes and nodded. "A worthy quest." He stood straight, then, and oddly seemed much younger. "Halt turbolift." Data felt the slight deceleration. "Hmph. At least they don't talk back anymore." Data was cross-referencing talking turbolifts when the admiral asked him, "Is there anywhere around here that we can sit and visit?" Ten Forward was not crowded when they arrived. The admiral chose Data's -- and many crewmembers' -- favorite table, before the large front windows. He sat with some difficulty, and he turned his face outward. "Makes you feel like you're really out there, alone, doesn't it?" "Listen, Data," she said. "You could learn a lot from this one." Her gaze lingered on the admiral much longer than it had on him; indeed, siphoning through his memory banks for all times he had seen Guinan look at anyone, he found that the length of her gaze on the admiral was in the 99th percentile of mean gaze time per person per occurrence for all occurrences. Intriguing! The admiral also was peering back at her, curiously. Data hypothesized that she knew him but he did not know, or did not remember, her. Further research was indicated at a later time. He set a flag. "What can I get you to drink, Gentlemen?" Apparently, if Guinan was indeed familiar with the admiral, she was not going to elaborate now. The admiral broke off his study of her. "Altair water." Data had never tried this beverage. "I shall have an Altair water as well, Guinan." She glided away. "Well, I guess you have a Vulcan's taste in drinks." "Indeed?" The admiral nodded. "But you, sir, are not a Vulcan." "Let's just say I got the taste for it from Spock." Data knew, of course, about the Fal-Tor-Pan procedure; many articles had been written about it, although virtually no solid information had been gained as to its workings; the Vulcan elders were not generally forthcoming with such information. "Begging your pardon, sir, but is that because you once carried the Ambassador's katra?" The admiral glared at him. "Now, just what do you know about that, Boy?" Data opened his mouth to relay the requested information. "No, never mind." At that moment, Guinan returned with their drinks. The admiral tasted his, as Data did his own. He set a secondary processor to analyze the molecular content, for his current conversation was more important. After all, he could obtain another Altair water at any time. After a few sips, the admiral continued. "Let's just say, all that Vulcan mumbo-jumbo is a blessing and a curse. But it *is* a way of really getting to know someone." Indeed, the admiral's case was unique. He must know Ambassador Spock's mind better than perhaps any other being could. And yet ... "And yet, it was Admiral Kirk to whom you were eventually married." The admiral shot one apparently disapproving glance at Data, but then his expression became what Data interpreted as more relaxed, tender. "Yes. Jim and I ... had something special." His eyes drifted until they found a focus approximately 100 centimeters behind Data's head. Data recognized this expression as one which humans displayed when their thoughts were of some other time or place. After five seconds, the admiral returned his attention to his drink. Data was waiting for this to happen, because he had located a contradiction between his memory files and his intake buffer. The admiral, sighing, slowly moved his eyes to Data. "What now, Boy?" "The fact of your marriage to Admiral Kirk does not mesh with my other information about you. For instance, if I were to extrapolate from all previously-known data about the relationship among you, Admiral Kirk, and Ambassador Spock, without taking into account my current knowledge of the events which, in fact, have occurred, I would most likely predict that the three of you would join in a triune marriage." Data saw the lines in the admiral's forehead deepen; his left hand clenched into a tight fist on the tabletop. A flash of light glinted from his eye. "Vulcans have their own ideas about such things, Boy. And anyway, I thought you wanted to talk about emotion. Not much of that to go around with Vulcans." He grabbed his drink, holding it between his face and Data's. Again, here was a display of emotion which Data could not begin to understand. "Yes, sir. I beg your pardon, sir." Actually, Data thought then, he might be able to understand it after all. Sometimes humans showed these small bursts of pique when they felt that their privacy was being violated; when they felt that someone (usually he himself) was asking too many questions about topics which they did not wish to discuss. This anger was a means to "put him off the scent," as it were. And, he reflected further, these attempts at distraction most often occurred when his line of questioning was coming near to what would prove to be an elemental truth, one which the humans often did not want to acknowledge, even to themselves. Intriguing! Still, he would "tread more lightly" from now on. At that point, Guinan padded softly by, favoring the admiral with her gaze again. He lowered his shoulders and put down his glass, seeming to relax and to forgive Data. "Look, Son. If you want to understand human emotions, you couldn't do better than studying love. Although it's not really an emotion, we get so many emotions from it." A list! "Yes, sir: envy, anxiety, embarrassment, anger, jealousy, grief, sometimes even hatred. Intriguing! These are all emotions that most humans consider unpleasant. Yet why do they continue to seek out love in spite of the side effects?" "I'll tell you why, Son. It's because love is something you can keep. Something you'll always have, as long as you live." Then the admiral smiled, and Data suddenly knew what he had been doing wrong all along. His own imitative smiles always looked artificial. Data found out by studying the admiral's features that indeed, when he smiled, it was not an all-at-once thing. It was more of an organic process, akin to the blooming of a flower, as first the admiral moved one muscle, then another and another in turn, forming a series of exactly twenty-six distinct and complex expressions before the final smile was achieved. In contrast, when Data smiled, he simply moved every servo at once until the pseudo-smile was "pasted" onto his face. Data backed up his visual records for the previous three seconds in protected memory, just in case. And he was equally fascinated to see that the admiral's face did not hold the smile. Muscle by muscle, the smile faded; first around his eyes and cascading until there was only a hint left. "You know what happened ... to Jim, don't you, Son?" "Yes, sir; he was killed in the line of duty in Earth year 2293. While visiting the Enterprise-B during her maiden voyage, he died while rescuing a transport vessel from a powerful energy ribbon. By his actions in the shield generator room, he saved many civilian lives and was honored as a hero." "Hero." The admiral's voice was so quiet that Data needed to turn up the gain on his auditory sensors by 3%. Again the exquisitely-expressive face transformed itself almost imperceptibly; moisture formed in the corner of his left eye; he reached to dash it away -- but the hint of a smile remained. "Tell you what, Son -- and put this in your memory banks -- I don't really believe he's dead." "Sir?" The admiral was no longer a young man. Perhaps he was suffering from some age-related memory malfunction. "The historical records are detailed. Although no remains were ever found, the preponderance of the evidence makes clear ... "
The admiral moved to stare intensely into Data's eyes, his biosigns increasing; but still he spoke in low tones. "Oh, I know he's dead, Boy. I *know* it. But I don't *believe* it." His fist thudded against his chest. "Every day, at least once, I think of him; and I believe he's just in the next room. I wonder what he's doing, and think maybe I'll go in and talk to him." He pointed his finger to shake at Data. "And I'll always have that, as long as I live and breathe. Doesn't matter where he really is." He sat back, composing himself. His breathing slowed. "Remember, Son, if you love someone, you have to take that chance. The chance that they might leave you, or they might not be around as long as you. You bein' an android and all, I suppose you have a pretty long life expectancy." "Although I could be killed in the line of duty at any time, sir, you are correct. There has been no pre-set limit on my lifespan." "You're just gonna have to risk it, then, Son. Because you'll never understand love unless you find someone to love ... the way I love Jim." Data doubted whether he could ever do that. Granted, he did understand much more about facial expressions now than before, but could he really experience such an emotion? And, knowing all that came with love, did he want to? "Then I do not think I shall ever understand, sir." But the admiral was having none of it. He grew animated. "You can't look at it that way, Boy! Think positive! For instance, that pretty gal over there. Looks like she's makin' eyes at you." Data, curious, began to turn around. "No, no, don't look! I mean, look casual. Pretend you're looking at something else." Data obeyed as best he could, pretending to study a plant to one side of the bar. He saw the person and turned back. "Ah! You refer to Lieutenant Yar, Chief of Security. A capable officer." "Capable officer. Well, I see there's still a lot of work for you to do. And, as much as I wish I could help you along, I have to be getting back to the Hood. I expect they're wondering where in tarnation I got to." Data rose and offered his arm to the admiral. "Now, how close did you say that shuttlebay is, Boy? Because I can't walk around here like this all day." "I did not ... actually, it is ... not far." Data was still confused, however. "I still do not understand why you do not wish to beam over, sir." "Maybe that's one of the things that you'll never understand." Challenge 62. 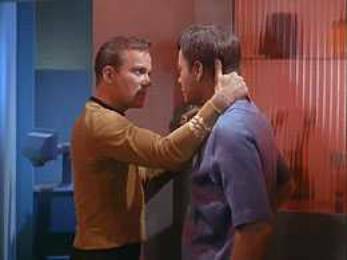 McCoy tells Data about his love for Kirk.